Vaccinium vitis-idaea is called cowberry in the United States, United Kingdom and Ireland and lingonberry in North America. The name cowberry is derived from the scientific name Vaccinium, which comes from vaccinus, an adjective from Latin vacca “cow”. The name lingonberry originates from the Swedish name lingon for the species. 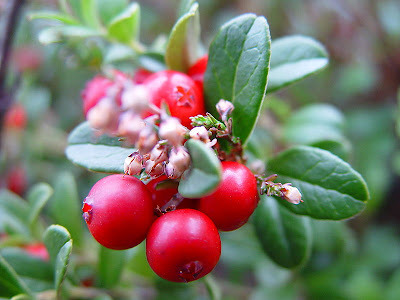 Other names include csejka berry, foxberry, quailberry, mountain cranberry, red whortleberry, lowbush cranberry, mountain bilberry, partridgeberry (in Newfoundland and Cape Breton), and redberry (in Labrador). Because the names mountain cranberry and lowbush cranberry perpetuate the longstanding confusion between the cranberry and the lingonberry, some botanists have suggested that these names should be avoided. Vaccinium vitis-idaea spreads by underground stems to form dense clonal colonies. Slender and brittle roots grow from the underground stems. The stems are rounded in cross-section and grow from 10 to 40 cm (4 to 16 in) in height. Leaves grow alternately and are oval, 5–30 mm (0.2–1.2 in) long, with a slightly wavy margin, and sometimes with a notched tip. The flowers are bell-shaped, white to pale pink, 3–8 mm (0.1–0.3 in) long, and produced in the early summer. The fruit is a red berry 6–10 mm (0.2–0.4 in) across, with an acidic taste, ripening in late summer to autumn. Vaccinium vitis-idaea keeps its leaves all winter even in the coldest years, unusual for a broad-leaved plant, though in its natural habitat it is usually protected from severe cold by snow cover. It is extremely hardy, tolerating as low as -40 °C (-40 °F) or lower, but grows poorly where summers are hot. It prefers some shade (as from a forest canopy) and constantly moist, acidic soil. Nutrient-poor soils are tolerated but not alkaline soils. Cowberry. Eurasia. Leaves 10–30 mm (0.4–1.2 in) long. Lingonberry. North America. Leaves 5–18 mm (0.2–0.7 in) long. The berries collected in the wild are a popular fruit in northern, central and eastern Europe, notably in Nordic countries, the Baltic states, Germany, Austria, Switzerland, Czech Republic, Poland, Slovenia, Slovakia, Romania, Russia, and Ukraine. In some areas they can legally be picked on both public and private lands in accordance with the freedom to roam. The berries are quite tart, so they are often cooked and sweetened before eating in the form of lingonberry jam, compote, juice, smoothie or syrup. The raw fruit are also frequently simply mashed with sugar, which preserves most of their nutrients and taste. This mix can be stored at room temperature in closed but not necessarily sealed containers, but in this condition, they are best preserved frozen. Fruit served this way or as compote often accompany game meats and liver dishes. In Sweden and Norway, reindeer and elk steak is traditionally served with gravy and lingonberry sauce. Preserved fruit is commonly eaten with meatballs and potatoes in Sweden and Norway, and also with pork. In Sweden and Russia, when sugar was still a luxury item, the berries were usually preserved simply by putting them whole into bottles of water. This was known as vattlingon (watered lingonberries); the procedure preserved them until next season. This was also a home remedy against scurvy. In Russia this preserve had been known as “lingonberry water” and is a traditional soft drink. In Russian folk medicine, lingonberry water was used as a mild laxative. A traditional Finnish dish is sautéed reindeer (poronkäristys) with mashed potatoes and lingonberries, either cooked or raw with sugar. In Finland, a porridge made from the fruit is also popular. In Poland, the berries are often mixed with pears to create a sauce served with poultry or game. The berries can also be used to replace red currants when creating Cumberland sauce to give it a more sophisticated taste. Lingonberries are also popular as a wild picked fruit in Canada in the Canadian province of Newfoundland and Labrador, where they are locally known as partridgeberries. In this region they are also incorporated into jams, syrups, and baked goods. Lingonberries are a staple item in Sweden, and at the Swedish retailer IKEA. 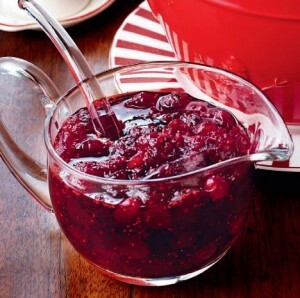 It is often sold as jam and juice in the store and as a key ingredient in dishes. They are used to make Lillehammer berry liqueur, and in East European countries, lingonberry vodka is sold. The berries are an important food for bears and foxes, and many fruit-eating birds. Caterpillars of the Coleophoridae case-bearer moths Coleophora glitzella, Coleophora idaeella and Coleophora vitisella are obligate feeders on Vaccinium vitis-idaea leaves. The berries contain plentiful organic acids, vitamin C, provitamin A (as beta carotene), B vitamins (B1, B2, B3), and the elements potassium, calcium, magnesium, and phosphorus. In addition to these nutrients, they also contain phytochemicals that are thought to counteract urinary-tract infections, and the seeds are rich in omega-3 fatty acids. In folk medicine, V. vitis-idaea has been used as an apéritif, astringent, antihemorrhagic, anti-debilitive, depurative, disinfectant/antiseptic (especially for the urethra), a diuretic, a tonic for the nervous system, and in various ways to treat breast cancer, diabetes mellitus, rheumatism, and various urogenital conditions.